News | Do You Hear The Music? Trampled by Turtles fans listen up and give a listen to Dead Man Winter aka TBT frontman Dave Simonett. Click play below to listen to “Red Wing, Blue Wing” off his upcoming album, Furnace, set for release on January 27. More words and tour dates from Rolling Stone can be found HERE. Road to Life is Beautiful Battle of the Bands was a success and then some. Thank you, Las Vegas! The last few weeks have been some of the most rewarding since being in my position with Life is Beautiful. In year one we held Downtown Las Vegas Music Showcases to highlight local bands and a handful ended up on the lineup. Last year we partnered with First Friday and delivered an evening of music across double digit venues and stages in Downtown Las Vegas. This year we raised the stakes, took a gamble and it was simply beautiful. Somewhere I got another crazy idea that we should do a Battle of the Bands and turn it into March Madness bracket-style tournament. We started with 16 bands being selected, Brooklyn Bowl on the Las Vegas Strip was the host site and as the weeks carried on we scaled down to the Final Four which was held last night at Brooklyn Bowl. 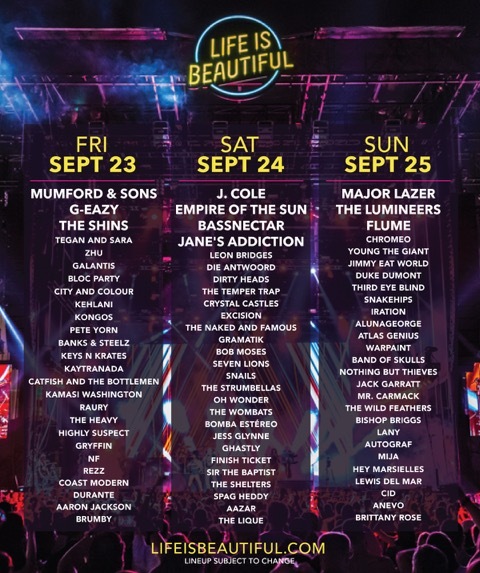 Four killer, 30-minute performances which ended with Brittany Rose emerging victorious and now added to the 2016 Life is Beautiful lineup. The crowds were impressive, the performances were great and all in it’s a good time to be involved with the local music scene in Las Vegas. I encourage everyone in town to get out and discover some homegrown music because we have a new crop of musicians waiting for you to discover them. At the beginning I mentioned that these have been some of the most rewarding weeks for me and that’s because of the 16 bands/artists who graced the stage at Brooklyn Bowl. All of the performers carried themselves in a professional manner, rallied to support one another during their performances and we’re genuinely stoked for the opportunity. It was truly special to see the care and excitement they had for one another even though they were all in competition with each other. That’s what a community is about and I’m proud to be a part of it. To All Night Visitors, Brittany Rose, Chop808, Daniel Park Band, Echo Stains, Ekoh, Glasspools, Jessica Manalo, Moonboots, O Wildly, Silversage, The American Weather, The Musket Vine, The Noir Movement, Walk Off Hits and We Are Pancakes, thanks for letting me be part of the ride.